Carlton Cinema, c. 1920. Source: Art Deco in Dublin. Christmas 1915 was worth celebrating for those involved in the cinema in Ireland. Despite the war and attempts by religious groups to limit its expansion, cinema had continued to grow in 1915, and several new picture houses opened in time for end-of-year holiday season. In many ways, then, a short item in the trade journal Bioscope in December 1915 on the recent opening of an Irish cinema well characterizes the state of the industry as a whole at the end of 1915. “They say,” it began, “nothing succeeds like success” (“Trade Topics”). However, the success of cinema in 1915 needs to be qualified as well as acknowledged. For a start the short Bioscope item appears to be a promotional piece with little substance. It continues: “but what Mr. Andy Wright said a few nights ago when, in opening the doors for the first time of his new theatre at Waterford, he was knocked down in the rush of an eager populace anxious to secure their seats, is not recorded.” Not recorder either – by this item or other contemporary sources – is what the name of this new theatre was. Not that Wright was unused to the openings of Irish picture houses. Best known as the managing director of the Liverpool-based distribution company Films, Limited and of Wright’s Enterprises, he was also heavily involved in a number of exhibition companies in Ireland. He was a director of Irish Empire Palaces, of the company that built and ran Dublin’s Phoenix Picture Palace, and of Southern Coliseums (“World of Finance”; Paddy, 7 Nov.). Following successes in Wexford and Kinsale during summer 1915, he had opened the Cinema in Carlow in September (Paddy, 9 Sep.). However, this item – if it has any basis in reality – must refer to the opening two months earlier of Waterford’s Coliseum, following its conversion from the Waterford Rink (Paddy, 28 Oct.). 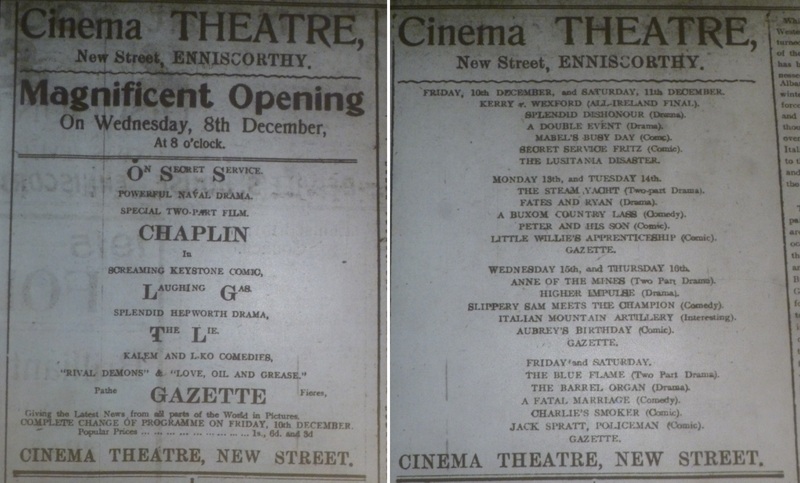 Ads for the opening weeks of Enniscorthy’s Cinema Theatre, Echo Enniscorthy 4 Dec. 1915: 6, and 11 Dec. 1915: 6. Among the actual openings for the 1915 Christmas season were picture houses in Enniscorthy, Belfast and Dublin. Enniscorthy’s new Cinema Theatre opened on Wednesday, 8 December, at the Ancient Order of Hibernian’s hall on New Street, which on the occasion, “was crowded, and many people were turned away. The hall was cosily fitted up. The screen proved to be large and the pictures to be clear and bright” (“New Cinema”). All the machinery, fittings and films for the new Cinema Theatre had been provided by Norman Whitten’s General Film Supply, which was also fitting out the picture house in Waterville, Co. Kerry, (Paddy, 9 Dec.). With a population of just 5,500, Enniscorthy could sustain this new picture house alongside the existing Abbey Picture House. Nevertheless, the Abbey put on a rival programme of comedies for 8 December designed to maximize its own audience. Competing with the Cinema Theatre’s naval drama On Secret Service (US: American, 1915) and Chaplin two-reel comedy Laughing Gas (US: Keystone, 1914), the Abbey topped its bill with the Chaplin six-reel feature comedy Tillie’s Punctured Romance (US: Keystone, 1914). 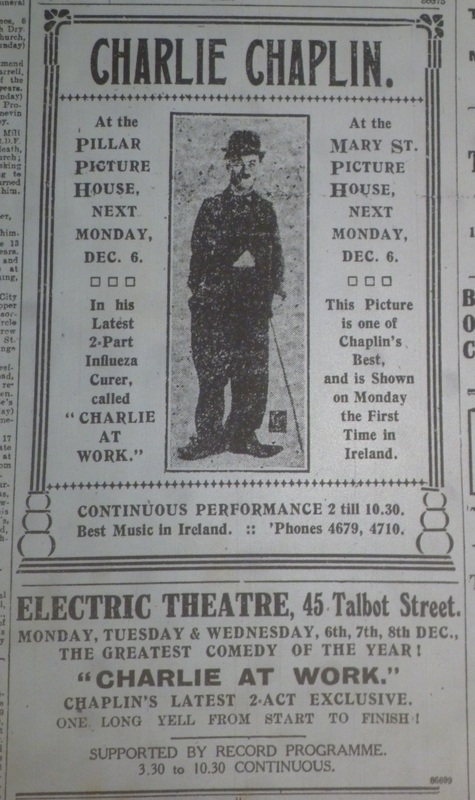 Dublin picture houses advertising the first showings of Chaplin’s latest film Charlie at Work. Evening Telegraph 4 Dec. 1915: 1. Enniscorthy did not have a monopoly on Chaplin. He was still everywhere, with the films he made with Keystone in 1914 still in circulation while his newer Essanay films received special advertising. When Dublin’s Pillar Picture House, Mary Street Picture House and Electric Theatre, Talbot Street premiered the new Charlie at Work on 6 December, Getting Acquainted (US: Keystone, 1914) maintained the audience of the Picture House, Sackville/O’Connell Street “in continuous roars of laughter,” while at the Masterpiece Theatre, one of the Keystones in which Chaplin played alongside Ford Sterling “kept the house in an uproarious mood” (“Picture House,” “Masterpiece”). Of the many other stars, perhaps Mary Pickford was the only one to approach Chaplin. On 2 December, Cork’s Coliseum showed Mistress Nell, which featured Pickford, “who has become such a prime favourite in many Irish picture theatres” (Paddy, 2 Dec.). Willowfield Picture House and Unionist Club. Cinema Treasures. Neither Chaplin nor Pickford topped the bill when Belfast’s newest cinema the Willowfield Picture House opened on 20 December. There was nothing at all unusual about the military mien of the featured drama The Commanding Officer (US: Famous Players, 1915), even when it was complemented by a local topical film of The Inspection of the Ulster Division (1915). The latter film was, however, unusually appropriate for a venue that was also the social club for the Ulster Unionist Party. Evening Telegraph, 24-25 Dec. 1915: 4. Dublin’s newest cinema was less out of the ordinary. 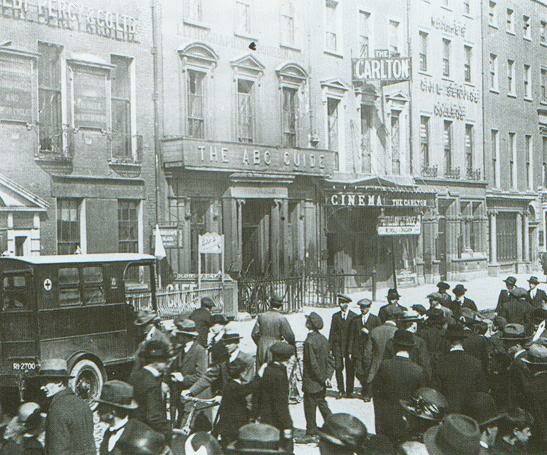 When the Carlton Cinema Theatre opened its doors on 27 December, it was the last new Irish picture house of 1915. Located at 52 Upper Sackville/O’Connell Street, it had been designed by architect Thomas F. McNamara for Frank W. Chambers, who also ran a tobacconist and billiard hall on the same street. “There is a magnificent entrance and lounge – the latter also being a tea room,” the Bioscope’s Paddy noted, “which lend an imposing appearance to the whole theatre” (6 Jan.). Inside, “[t]he hall is very spacious and well proportioned; the slope in the floor is a distinct improvement, whilst the scheme of decoration and lighting is very effective (“New Carlton Cinema Theatre”). The main opening film was His Wife’s Story (US: Biograph, 1915), which was accompanied, Paddy revealed, by an “orchestra, which consisted of two violins, a piano and a ‘cello.” He predicted that “with the improvement which is bound to come in the course of time, [it] should prove one of the best orchestras in Dublin.” All reviewers commented on the lack of expense spared by Chambers in fitting out the cinema, including in the generator and projectors chosen. “There is, indeed,” the Irish Times declared confidently, “little likelihood of spectators having to suffer the delay of a breakdown, in the Carlton” (“New Picture House”).This was just tempting fate because the same paper reported on 20 January 1916, that a breakdown in the generator had been repaired and that “the light on the picture screen is now perfect” – suggesting previous imperfections – for upcoming screenings of the adaptation of Arthur Conan Doyle’s A Study in Scarlet (“Carlton Picture Theatre”). Despite such initial technical difficulties, the Carlton would become one of the city’s most popular cinemas. Partly this was because of its favourable location opposite the Gresham Hotel, but it was also because of the musical attractions it would soon offer. In doing so, it would have to compete with two well-established rivals, the nearby Rotunda and the suburban Bohemian. At the Rotunda, “[t]he music, which is now an important feature of a Picture Entertainment, is supplied by the first-class Orchestra, under the baton of Miss Murphy, R.I.A.M.” (“Rotunda Pictures”). However, the state of the art in film accompaniment in Dublin was to be heard at the Bohemian, and in December 1915, it was about to popularize the cinema solo. “The success attendant on the violin solos given by Miss M. Burke, a member of the Bohemian orchestra, during the performances of last week,” an Evening Telegraph reviewer revealed, “doubtless influenced the management to engage for the present week the services of Mr. Patrick Delaney, the celebrated violinist, who rendered at the 7 and 9 performances some delightful selections, which were warmly applauded by large audiences” (“Bohemian”). Although the Bohemian management decided to engage a male soloist, this development was started by one of the city’s skilled women musicians. This Miss M. Burke is likely Mary Burke, who in the 1911 Census is listed as a Galway-born music teacher living in the nearby suburb of Drumcondra. Dublin’s Bohemian Orchestra helped reopen Galway’s Victoria Cinema. Connacht Tribune 25 Dec. 1915: 4. The Bohemian and Galway would have other connections at Christmas 1915. Galway saw the reopening of two of its picture houses – the Cinema Theatre and the Victoria Cinema – on St. Stephen’s Day, 26 December. The main Christmas pictures at the other cinemas – the Court Theatre and the Town Hall Pictures – were serials, the firth episode of The Black Box (US: Universal, 1915) in the case of the Court and the eighth episode The Exploits of Elaine The Exploits of Elaine (US: Wharton, 1914) at the Town Hall. This sense of business as usual was not adopted by the reopening venues, which offered special musical features. The Cinema Theatre under new manager George Gutherie, engaged two singers, “Australian Prima Donna” Marie Elster, who sang “Ave Maria,” and juvenile Irish vocalist Ruth Conway. Among its main alterations, the Victoria Cinema had erected a veranda to protect queuing patrons from the rain, replaced its screen and installed a new projector “to prevent delays between the parts of one picture.” These infrastructural enhancements were launched by a three-day visit from Percy Carver’s Bohemian Orchestra, “acknowledged by press and public as the finest in Ireland” (“Notes & News”). Whether or not Mary Burke was among the visiting musicians is not recorded. Christmas was celebrated in picture houses around the country with such traditional fare as pantomime films but also with more recent innovations. The Cork Examiner’s review of Robinson Crusoe at Cork’s Coliseum asserted the superiority of the cinema version over the theatrical. “There must be more than ‘Crusoe’s’ own adventures in the modern [theatrical] pantomime. Topical songs are introduced, and this distracts the attention from the mariner’s adventures. It is here the cinema producer scores, for he can keep the main story before the mind all the time” (“Coliseum”). Christmas provided the opportunity for showmen and -women to mount extra film entertainments and for travelling picture shows to visit smaller towns that did not have a regular cinema. James Barrett was granted a licence for a film show in Castlebar’s Town Hall (“Castlebar Urban Council”). With a population of just over 1,500, Granard, Co. Longford, hosted a “highly attractive cinema and gramophone entertainment” at the Town Hall on 29-30 December, “organised for the comforts’ fund of the various battalions of the Leinster Regiments” (“Granard Notes”). Cinema’s role not only as entertainment but also as a recruiting tool was an important way in which its social usefulness was measured in Christmas 1915. Those men who had not yet enlisted were encouraged to do so by recruitment meetings that included films in Macroom, Charleville and other Co. Cork towns (“Macroom Notes,” “Recruiting Rally”). By contrast, the Freeman’s Journal indicated that some popular films and plays were attempting to prevent recruiting. Praising recruiting efforts around the country, an editorial item observed that the “Irish capital has certainly done magnificently, and perhaps the greatest incentive to recruiting in our midst has been the idiotic pin pricks of the pro-German humbugs, passing as melodramatic Emmets and cinematograph Wolfe Tones” ([Editorial item]). Although it is unlikely that the writer had yet seen it, Sidney Olcott’s Irish-shot Bold Emmett, Ireland’s Martyr (US: Sid Olcott Feature Players, 1915) – steeped in the Irish melodramas of Dion Boucicault – could have been so described. Picture house advertising helped fund some of the radical nationalist press; Nationality, 4 Dec. 1915: 3. Available online from the National Archives of Ireland. Other kinds of cultural nationalist propaganda also rejected cinema. Minnie McAllister of Magherafelt, Co. Derry, the recipient of the third prize in the Columban League of Irish Youth essay competition, included going to the pictures among the foreign manners and customs that Irish boys and girls should avoid. “There is nothing in these performances that appeals to the real Irish imagination,” she wrote, “and frequently enough they are of a description that should not be tolerated in any self respecting country” (“Columban League of Irish Youth”). Edward O’Dwyer, bishop of Limerick, was of a similar opinion. Just in time for the New Year, he wrote a letter on the exhibition of an immoral film in Limerick city to Fr J. A. O’Connor, administrator of St Michael’s parish that was published nationally in the Cork Examiner and Freeman’s Journal (“Indecent Picture Exhibitions,” “Immoral Pictures”). “On last Wednesday,” he revealed, “a picture was shown in one of these houses, and from the descriptions which has been give to me of it, I feel bound to take the strongest steps within my power as a Catholic Bishop, to prevent the continuance of such an agency of corruption” (ibid.). The description of which film so incensed the bishop is not clear, but he seemed disinclined to confirm its offensiveness by actually viewing the film before urging that swift steps be taken against the picture house in question. On the last day of the year, Limerick’s Vigilance Committee informed the Borough Council through the pages of the Limerick Leader that it could within days expect the Committee’s draft restrictions to be included in subsequent cinematograph licences (“Limerick Vigilance Association”). At a meeting earlier in the month in which the Dublin Vigilance Committee revealed that it had been granted representation at the Recorder annual hearings to grant – or deny – music licences to picture houses, the Committee had acknowledged the increasing national reach of the vigilance movement by changing its name to the Irish Vigilance Association (Dublin Committee) (“Dublin Vigilance Committee”). As 1915 ended, cinema was certainly a more important cultural force in Ireland than it had ever been, seen as variously profitable, pleasurable and useful. However, it had formidable local opponents ranged against it that were more organized and determined to curb its influence or to destroy it. “The Bohemian.” Evening Telegraph 7 Dec. 1915: 2. 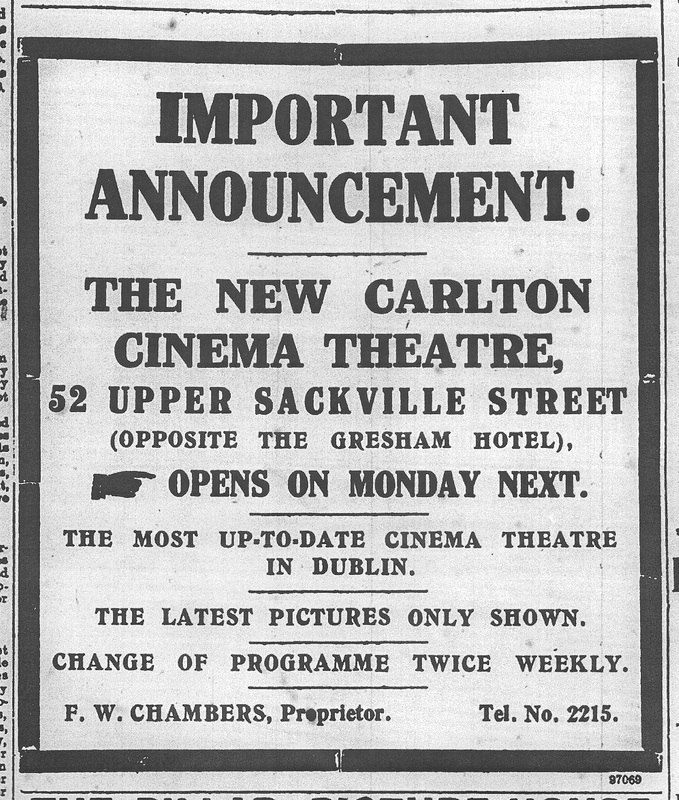 “The Carlton Picture Theatre.” Irish Times 20 Jan. 1916: 8. “Castlebar Urban Council.” Western People 18 Dec. 1915: 2. “Coliseum: ‘Robinson Crusoe.’” Cork Examiner 28 Dec. 1915: 6. “Columban League of Irish Youth: Occasional Chats with the Members.” Donegal News 18 Dec. 1915, p. 7; Ulster Herald 18 Dec. 1915: p. 3. “Dublin Vigilance Committee.” Evening Telegraph 4 Dec. 1915: 3. [Editorial Item.] Freeman’s Journal 18 Dec. 1915: 6. “Granard Notes.” Longford Leader 25 Dec. 1915: 1. “Immoral Pictures: Letter from Most Rev. Dr. O’Dwyer.” Freeman’s Journal 30 Dec. 1915: 6. “Indecent Picture Exhibitions: Letter from Most Rev. Dr. O’Dwyer.” Cork Examiner 30 Dec. 1915: 4. “Limerick Vigilance Association: And Local Picture Houses: Important Restrictions Proposed.” Limerick Leader 31 Dec. 1915, p. 10. “Macroom Notes.” Southern Star 18 Dec. 1915: 5. “The Masterpiece.” Evening Telegraph 7 Dec. 1915: 2. “Nenagh Town Council and Retrenchment.” Nenagh News 25 Dec 1915: 2. “The New Cinema.” Echo Enniscorthy 11 Dec. 1915: 7. “A New Picture House.” Irish Times 30 Dec. 1915: 3. “Notes & News.” Connacht Tribune 25 Dec. 1915: 4. Paddy. “Pictures in Ireland.” Bioscope 7 Nov. 1912: 417; 9 Sep. 1915: 1176; 28 Oct. 1915: 468; 9 Dec. 1915: 1109; 30 Dec. 1915: 1472; 6 Jan. 1916: 53. “The Picture House, O’Connell St.” Evening Telegraph 7 Dec. 1915: 2. “Recruiting Rally in North Cork.” Cork Examiner 29 Dec. 1915: 8. “Rotunda Pictures.” Evening Telegraph 24 Dec. 1915: 6. [Small ad.] Meath Chronicle 4 Dec. 1915: 5. “Trade Topics.” Bioscope 23 Dec. 1915: 1307. “World of Finance.” Bioscope 7 Mar. 1912: 689; 13 Jun. 1912: 807.